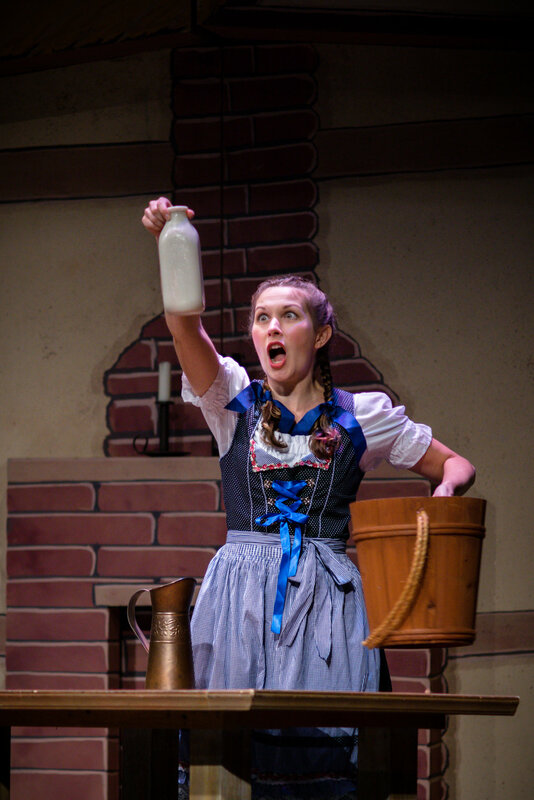 With Kate Tombaugh (Hansel) in Hansel und Gretel with Stockton Opera, 2018, (c) Erich Rau. As Lise in Opera Parallèle's Les enfants terribles with Hadleigh Adams as Paul. (c) Steve DiBartolomeo. Gloria in Handel's "O come chiare e belle"
As Papagena in Hawai'i Opera Theatre's Magic Flute, 2015. (c) Daivd Takagi. As Papagena with Kurt Olds (Papageno) in Hawai'i Opera Theatre's Magic Flute, 2015. (c) Cory Lum. As the Old Woman/Papagena in Hawai'i Opera Theatre's Magic Flute, 2015. (c) David Takagi. Thérèse in Poulenc's Les Mamelles de Tirésias with Opera Parallèle, 2014. © Steve DiBartolomeo, Westside Studio Image. Jessie in Weill's Mahagonny Songpiel with Opera Parallèle, 2014. © Steve DiBartolomeo, Westside Studio Image. La cartomacienne in Poulenc's Les Mamelles de Tirésias with Opera Parallèle, 2014, with Gabriel Preisser (Le Mari) and Hadleigh Adams (Le Gendarme). © Steve DiBartolomeo, Westside Studio Image. Rehearsal with Opera Parallèle, 2014. © Steve DiBartolomeo, Westside Studio Image. Susanna with Michelle Detweiler (Cherubino), Christie Hageman (Contessa) in Mozart's Le nozze di Figaro with Stockton Opera, 2013. © Steve Pereira. Act II as Gianetta in Donizetti's L'elisir d'amore at the Santa Fe Opera, 2009. Gianetta and Nemorino (Dimitri Pittas) in Donizetti's L'elisir d'amore at the Santa Fe Opera, 2009. Norina in Donizetti's Don Pasquale at the Santa Fe Opera, 2009. Zaide in Mozart's Zaide (with David Sailsbury-Fry) at the Santa Fe Opera , 2007. Zaide in Mozart's Zaide (with Jesus Leon) at the Santa Fe Opera, 2007. St. Settlement in Thompson's Four Saints in Three Acts with Bard Opera, 2008. With pianist Hsin-Chiao Liao at the National Association of Teachers of Singing National Conference in Las Vegas Nevada, June 2018. With Eduardo Leandro after performing Ligeti's "The Mysteries of the Macabre," October 2016. Performing at the Finals of the International Hans Gabor Belvedere Competition in Cape Town, 2016. Working with composer George Crumb on his piece Apparition with Jonathan Korth and Randall Scarlata. With Taitung University Orchestra (Prof. Shieh conducting, Prof. Yang, Tenor), 2014.